Posted March 2nd, 2011 by Codastar & filed under Codastar News. Many organisations spend time setting up a website, adding content and expecting visitors to like what they find. Some receive great feedback and can promote their business and even sell products and services this way. However, there’s only so much you can gauge from this kind of one-way interaction and it’d be much more beneficial for you to find out who looks at your site, how they get to your site and what they do once they’ve found it. This is why it’s important to use analytics tools that will give you lots of information about your website, your content and your visitors that can ultimately help you to improve and work smarter. There are many analytics tools on the market, but Google’s free tool, Google Analytics is often considered the best. At first Google Analytics may seem a little daunting, but there are both simplistic and more detailed views of each function and everything can be controlled by the simple analytics sidebar on the left. 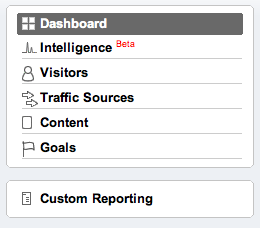 Here at Codastar we use Google Analytics to help our clients understand more about their websites. However, although Google Analytics is very accessible, we understand that sometimes you may not have the time to trawl through information and make sense of what it means to you and how you can move forward. This is why we use specialist software that we “plug into” analytics to help us generate in-depth reports that makes the progress of your website much easier to understand. These reports do not require you to navigate different pages of Google Analytics or spend time deciphering the data, they’re presented in an easy to understand PDF format for you to keep and share amongst your team. Talk to us if you want to better understand your website and make sense of confusing analytics data. All images via Google Analytics. Yes it is a very good way to measure all the various traffic sources to your website. Glad you find it easy. We find a lot of people struggle with it a bit, and also how to interpret the data, what it all means etc. So, we’ll post a few more tips about Analytics hoping it helps.